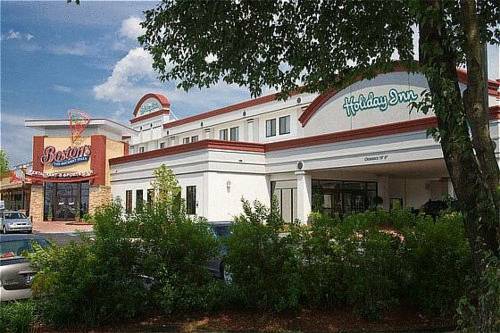 The Holiday Inn Conference Center is a perfect base to explore Little Rock. We are 10 mins from Downtown, Clinton Library and The Rivermarket Entertainment District, 10 mins from UALR, State Fairgrounds and 15 mins from Burns Park. We have so much to offer to our guests, 201 luxury guest rooms; over 20,000 square feet of flexible meeting space; concierge floor with private lounge; outdoor swimming pool; complimentary high-speed internet; free 24-hour business center; Boston's Restaurant & Sports Bar; A/V8 Cafe. Complimentary shuttle service to and from the Little Rock National Airport and the River Market Entertainment District. Conveniently located off of I-440, connecting I-30; I-40 and 67/167. Certificate of Excellence and Green Leader Awards with TripAdvisor. AV8 Atrium Dining: Conveniently located close to the elevators in the atrium. A grand breakfast room with quick service and a relaxing atmosphere. Boston's Restaurant and Sports Bar: A national franchise restaurant with a huge following: Gourmet pizza, pasta, salads, burgers, ribs, steak and more. Enjoy quick service, fun place and serious food. Childrens's program - Outdoor swimming pool available (lifeguard not on duty) parents must be present with children. O'Hare: This Board Room was built around a huge walnut conference table, adding the 12 leather high back chairs set the mood for a successful meeting. The side refreshment table is built in with marble tops. A 42" HDTV is mounted on the wall for laptop views. Reagan: There are four classrooms side by side, which is a great situation for break out rooms. The Reagan room is one of these four classrooms. It was designed to hold 30 people classroom style, but works in any set up you desire. Kennedy: The Kennedy room was designed to seat 30 people classroom style, however the room can be set to your desires in whatever style you prefer. Adams: This meeting room is perfect for a group that likes a little outside environment. The window allows the meeting to have a private feel and yet not be confined to four walls. Hobby: This is another of our meeting rooms that has the window to give the meeting another dimension and view. Enterprise: This meeting room works well in a banquet setting due to the decor, or as a meeting environment as well. The air walls allow the meeting room to divide for break outs or other meetings. Lindberg: The Lindberg sits inbetween the ballroom and the Enterprise meeting room. This large room can also be divided into three break out rooms. Kittyhawk: This huge ballroom is the center of attention for any convention. The location lends itself to convenience for meeting planners. At the rear of the Kittyhawk room is a hidden garage door that can be opened to allow loading and unloading into the room. McCain MallMajor renovation completed in 2013. Full shopping mall with a Dillards, J. C. Penney's, Sears, food court and many other boutizues and stores. Stonelinks Golf CourseTerrific Golf Course built on the same order as the Scottish Courses. This public course is open seven days a week. Bill & Hillary Clinton National AirportThe Airport is a terminal that has been recently renovated featuring a Starbucks and several other fast food restaurants. The name change to Bill and Hillary Clinton National Airport was a exciting change with added signage as you drive into the airport. Downtown Little RockDowntown Little Rock features the River Market District, full of entertainment and fine dining. President Clinton LibraryThe Clinton Library is one of the best Presidential collections in history. It also houses exhibits that change throughout the year. Old State House, Pres. Clinton SiteThis grand old building is on the historical register. It is where President Clinton accepted the nomination for the Presidency of the United States. Tours are very interesting and full of history. Willow Beach ParkThe park is ran by the Corp of Engineers and kept in terrific shape. It has docks for fishing, playgrounds and pavilions for grilling or picnics. Tac AirThis Service Station for Airplanes is connected with the Little Rock National Airport. It features a dining room called "Whole Hog" and has a nice reception room as well. L R Industrial Port AuthorityThis Industrial area is home to some of the largest manufacturing companies in Arkansas. Several new companies have moved in during the past few years and it is still growing. Burns Park Softball & Soccer FieldsThe largest Park in Arkansas with a lot of Ballfields, picnic area and playgrounds. Soccer Tournaments and Softball Tournaments are abundant in the springtime and fall. War Memorial Stadium & ZooA great little zoo with a cafe and playground. The new Cat Habitat is an added attraction. Barton Coliseum/State FairgroundsNot only are events held here throughout the year, during October the State Fair is buzzing with excitment in this building. Little Rock Air Force BaseThe Air Force Base has recently opened an Education Building at the Front Gate with a large airplane on display. With annual Air Shows and other exhibits it continues to be a huge attraction in Central Arkansas. Marlsgate PlantationA remarkable part of the Old South, this plantation house has been home to some beautiful weddings and receptions. With the antique furniture and charm it is a showpiece. Verizon ArenaFormerly Alltel Arena, this largest venue in Little Rock has been home to many huge concerts, games and events. It sits next to the Arkansas River on I-30, easy to locate with a lot of parking surrounding it. Bass Pro ShopNational Hunting and Fishing Store with added entertainment. Heifer VillageHeifer Village is a hands-on education facility with interactive exhibits teaching about causes and solutions for ending hunger and poverty around the world.